We're gearing up for another Superfest: International Disability Festival! This year marks our 30th anniversary so all of us at the Longmore Institute and our co-host organization, the SF LightHouse for the Blind and Vision Impaired, are feeling the pressure to make it our best year yet. 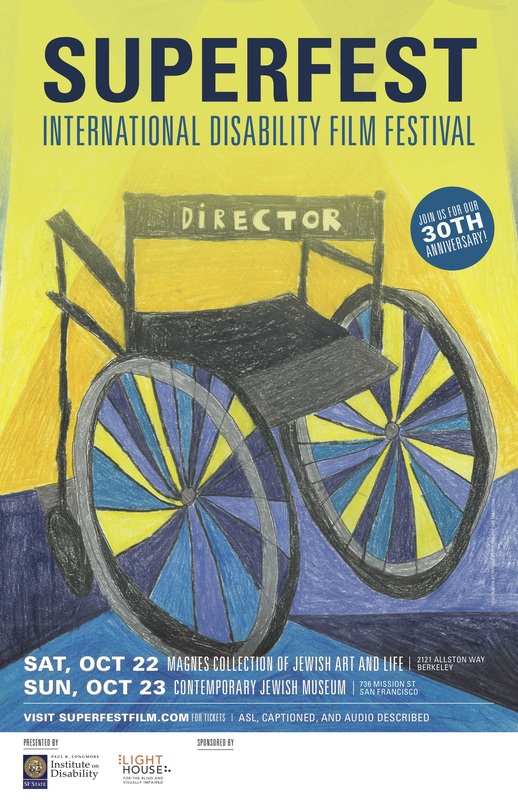 The longest running festival of its kind, Superfest celebrates disability as a creative force in cutting-edge cinema. While you still have to wait until October for Superfest 30, you need not wait to see this year's poster...Ta Da!!!! We partnered with The Arc San Francisco, which asked their artists, all people with developmental or intellectual disabilities, to generate artwork while considering the phrases 'disability' and 'films' for inspiration. With so many enticing submissions, it was a tough decision, but we chose artist Tatyana Boyko's brightly colored twist on a director's chair. Graphic designer Alexandra Soiseth added the text details. We can't wait to show off this dynamic piece as we lead up to the festival, and we'll also share some of the runner ups in the months to come. It's never too early to mark your calendar for this year's two-day event on Saturday, Oct 22 at the Magnes Collection of Jewish Art and Life in Berkeley and Sunday, Oct. 23 at the Contemporary Jewish Museum in San Francisco. With double the submissions from 2015, including entries from 18 countries, we're on track for an impressive and diverse line-up. You won't want to miss Superfest's 30th birthday bash!